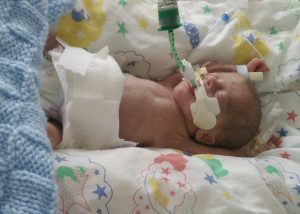 Miracle Babies – Support and guidance for parents of premature babies and neonatal loss. 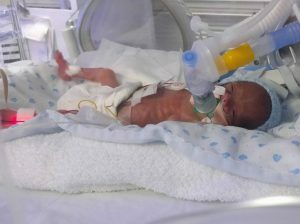 This website has been designed to offer help, guidance and hope to parents of premature babies and support for those who have experienced neonatal loss. 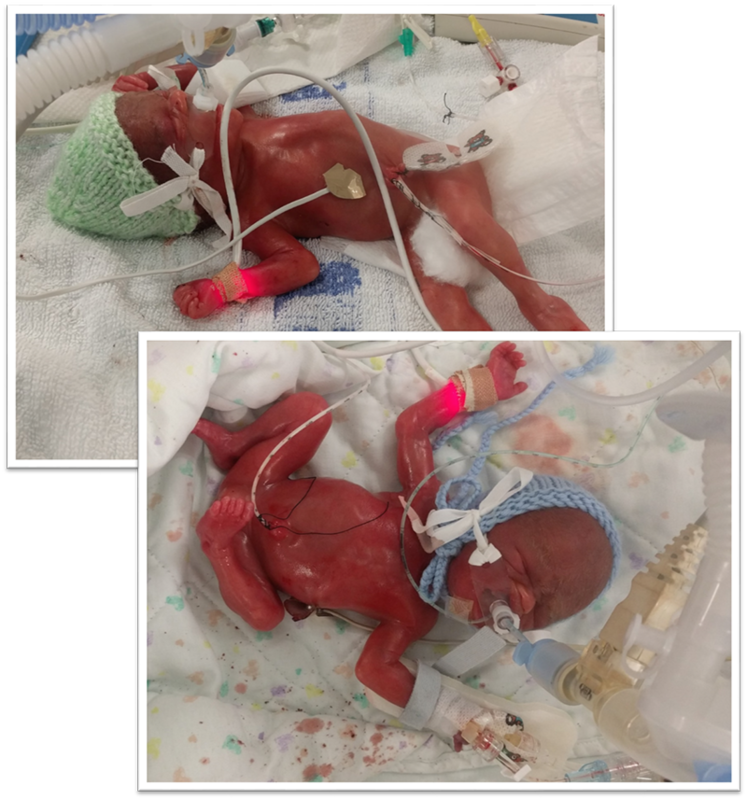 We spent 16 weeks under the care of the amazing team at the Oliver Fisher Neonatal Intensive Care Unit with our son Henry, who along with his twin brother, Archie, was born at just 23 weeks gestation. 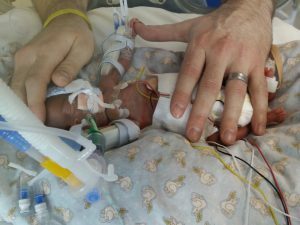 Archie sadly lost his battle on day 2 but Henry fought on and came home one week before his due date, the day before his mummy’s birthday on 18th April 2016. The following story, written by Henry and Archie’s mummy, follows what was arguably the scariest and longest night of her and her husband’s lives; the birth of their twin sons, Henry and Archie who were born four months early on 27th December 2015, both weighing just 1lb 2oz. It’s a long story so you may want to sit comfortably! Our journey beings on Boxing Day 2015 when I went into labour at just 22 weeks and 6 days pregnant. 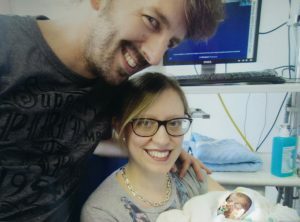 My husband and I turned up at the hospital expecting them to be able to stop the contractions but unfortunately, the first team of people with whom we were greeted was the paediatricians telling us they would do nothing for the babies as they were not yet 23 weeks gestation, which is what is deemed viable (officially the cut-off is 24 weeks); it was 9pm by this point so I was only three hours away from being 23 weeks! This was simply devastating to hear, how could they say that? How could they not be viable when I could still feel them rigorously kicking me inside, seemingly so full of life. Thankfully, shortly afterwards I was given the drugs to stop the labour along with a steroid injection (to help the babies’ lungs) but despite several doses and a night of hoping, wishing and praying, the contractions did not stop, although they had bought us precious time; when I did give birth it was the following morning, officially 23 weeks gestation, so two neonatal crash teams were ready and waiting to work on our babies. 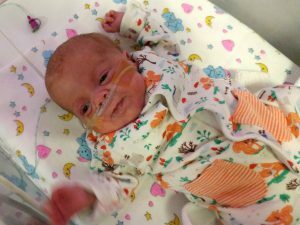 While I was in labour we were told it would be a miracle if either baby survived the birth but they both did pretty well at first and once they were stable they were transferred by neonatal ambulances to the Oliver Fisher Neonatal Unit. Once admitted, at first they were both placed under the blue phototherapy lights to treat them for jaundice. Archie was struggling to maintain his temperature so needed a lot of humidity in his incubator to keep him warm and it was very misted up as a result. They were both stable but Archie was on a lot of medication to keep him stable as he had very low blood pressure. Both boys had small bleeds on the brain but the doctors were not concerned. 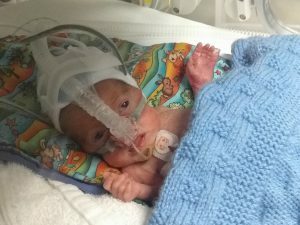 The second day took a turn for the worse for Archie as the medication was no longer keeping him stable, he was on 100% oxygen with his saturation very low meaning there was not enough oxygen getting to his vital organs; he was dying before our eyes so the only option left for us was to take him out of his incubator so that he could pass away peacefully in our arms. We had both boys blessed at this point. We had naively thought everything would be okay after making it through the first 24 hours but we were so wrong. Archie’s nurse was amazing, she helped us to bath and dress him and took beautiful photos of his final moments. After this we took hand and foot prints before wrapping him up and saying goodbye. 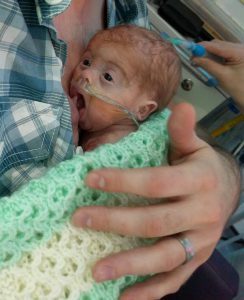 Following the tragic start to the week Henry made steady progress; at just two days old he started receiving a small amount of breast milk through a feeding tube and tolerated this really well. 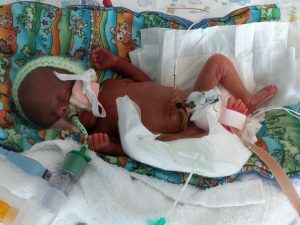 He had a PDA duct in his heart which is a very common condition in premature babies where the blood vessel that links the aorta to the pulmonary artery does not close after birth; he was put on a course of Ibuprofen to close it which, to our relief, was successful after three doses. Later that week was New Years Eve and we celebrated the occasion by Henry’s side. We watched fireworks through the window next to his incubator and read him lots of a stories which was lovely. On New Years Day I was able to change my first nappy, although this was daunting I was guided patiently every step of the way by Henry’s lovely nurse. It seems Henry is a very active and wriggly baby and had to have his morphine increased as a result! We also spent all week waiting for him to have his first bowel movement with no success! Speaking with the consultant, they have said they are very happy with Henry so far but it is still early days and there are many potential obstacles ahead of us. The mode was changed on his ventilator early in the week from HFO, which was constantly vibrating air into his lungs, to a mode that is more similar to real breathing. He had his first bowel movement on Monday so we were very pleased about that too! As Monday also represented the one week anniversary of losing Archie we lit a candle for him when we got home from the hospital and needless to say, shed a few tears. Henry has a small infection which is thought to have been caused by one of the plastic lines but he is not showing signs of illness and is responding well to antibiotics, he also opened his eyes for the first time midweek, they had previously been fused shut. Midweek we saw the first of, what would be, many extubation attempts, meaning he was taken off the ventilator to a less invasive breathing support not requiring a tube down his throat. 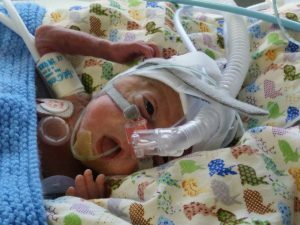 He was first put onto CPAP (Continuous Positive Airway Pressure) then to Vapotherm (a high pressured flow of oxygen through a nasal cannula) on which he lasted 14 hours before getting tired. He also had the arterial line removed from his belly button and overall had another stable week. 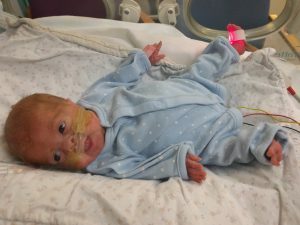 Henry’s lungs are now starting to show signs of respiratory distress so he has been put on steroids to help limit further lung injury caused by the ventilator. At the beginning of the week the top of his right lung partially collapsed but thankfully reopened the next day. During the week we really started to notice how much more control Henry seems to have over his hand movements; they used to be quite erratic but now they are more methodical which is nice to see. His eye movements are also more controlled, he seems to be focusing on things and both eyes are now moving together more often. Midweek he was extubated again, straight to Vapotherm this time, and again he lasted most of the night, 13 hours before getting tired so had to be re-intubated. The humidity has now been turned off in his incubator now that his skin is a little more mature. This was an eventful week but it had a magical start. As Henry’s incubator was due to be changed we were able to have our first cuddles with him. We held him for 15 minutes each which he tolerated really nicely. It was amazing to finally be able to hold our baby boy. This week’s consultant is going to let Henry grow rather than attempting extubation again so his milk is now being fortified with extra calories to help him gain weight. This worked really well and he gained weight rapidly all week. Midway through the week Henry’s oxygen requirements had to be increased and it was discovered that he had another partial collapse on the right hand side again. He started having physiotherapy for this and laying on his left to help it reopen. We had a very upsetting end to the week. 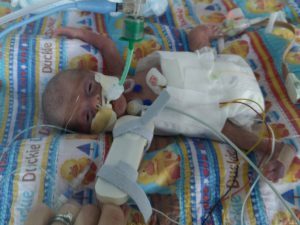 Henry developed sepsis and started fighting the ventilator, he had to be given oxygen manually as his oxygen saturation in his blood was not picking up. He had to be put back on HFO ventilation for a while and got very agitated and distressed. This was all very reminiscent of losing Archie with the doctor and nurses gathered around the incubator working on Henry. We both got very upset and had to step out to calm down. The on-call consultant prescribed Pancuronium, which is a strong muscle relaxant, that basically paralysed Henry, this wasn’t very nice to see but after this the ventilator was able to take over his breathing without him fighting it and he was finally stable. Henry started the week still requiring heavy sedation for a few days as every time it wore off he became very agitated and was sick. He ended up nil-by-mouth too and on very strong antibiotics to treat the sepsis. A long line had to be put in through his arm as his blood pressure became very low and needed treating with medication. At the beginning of the week he had a very eventful night and needed an arterial line to monitor his blood pressure more accurately as it was still very low, his heart rate then increased dramatically as a result of the blood pressure medication and his oxygen requirement was up to the eighties each time the sedation wore off. With all the IV infusions going in it felt like we had taken quite a few steps backwards. Henry’s vitals picked back up following this eventful night and Henry gradually made steady progress throughout the rest of the week. The sedation made him look quite puffy but apart from that he showed significant improvements and after two days they were able to use a milder sedative called Chloryl. Later in the week Henry managed to pee over me through the porthole in the incubator, this really made me laugh and was just what I needed following the tough start to the week! By the end of the week Henry was back to normal with the doctors talking about extubation again the following week. 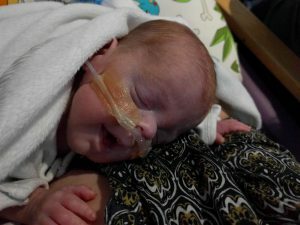 Things change fast in the NICU! Henry finished the week by extubating himself over night, he was tried on Vapotherm but only lasted 20 minutes this time, probably because he is still on quite a large amount of morphine. This week began much better than last, with an incubator change, meaning we were able to enjoy cuddles with Henry for the second time since his birth; we really needed them after the recent events! 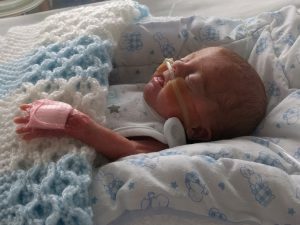 Early this week Henry was quickly weaned off his morphine over two days then extubated to CPAP again but did not cope well this time, he was quite agitated and only lasted a couple of minutes which was a little upsetting as we thought he would finally be free of the ventilator this time. It seems the morphine was stopped a little too quickly as he is now quite dependent on it. He has been put back on steroids again to help his lungs and fortifier in his milk to help him grow some more. Towards the end of the week he needed another blood transfusion. Henry’s long line was removed at the end of the week and he was quite agitated following this, in the space of the nurse being on her lunch break he kept desatting, needed suctioning by three different nurses, which didn’t help, and his oxygen requirement went up to 70%, he had to be given a dose of Chloryl to settle him. Following this he extubated himself again, they used the opportunity to try him on both Vapotherm and CPAP but, again, it was not successful, the nurse said he was breathing well but not taking in enough oxygen and therefore had to be re-intubated, following this it was revealed his lung had partially collapsed again so this was probably why he wasn’t able to take in enough oxygen. This week did not start well; Henry developed another infection so he was put back on strong antibiotics, his oxygen requirement had come back down a little following physiotherapy every four hours for his lung and lots of suctioning. As his infection markers were quite high he was given a lumbar puncture to rule out meningitis which thankfully came back negative. He has started to pull at his breathing tube a lot so has been given woollen mittens to wear, he seems ready to come off it now. By midweek Henry hit a whopping 2lb in weight! He had to have another cannula put in prior to being extubated and he got quite worked up during the process, managing to get one of the threads from his new woollen mittens wound tightly around two fingers which cut off the blood supply; luckily I walked back in from lunch at this point and while comforting him I noticed his fingers and notified the nurse who quickly grabbed some scissors and cut the threads off. We have said no more woollen mittens. Henry also ended up with a nasty wound on the back of his hand due to a bad reaction to the same cannula, a lot of the skin had come away and the hospital have documented it, the nurses are taking photos and are redressing it every day. Thankfully, Henry responded quickly to the antibiotics and was ready to be extubated again towards the end of the week. The consultant decided to leave him on morphine and wean very slowly this time as he is so dependant on it. This was a much better approach and as a result, extubation to CPAP was a success and Henry stayed off the ventilator at last! 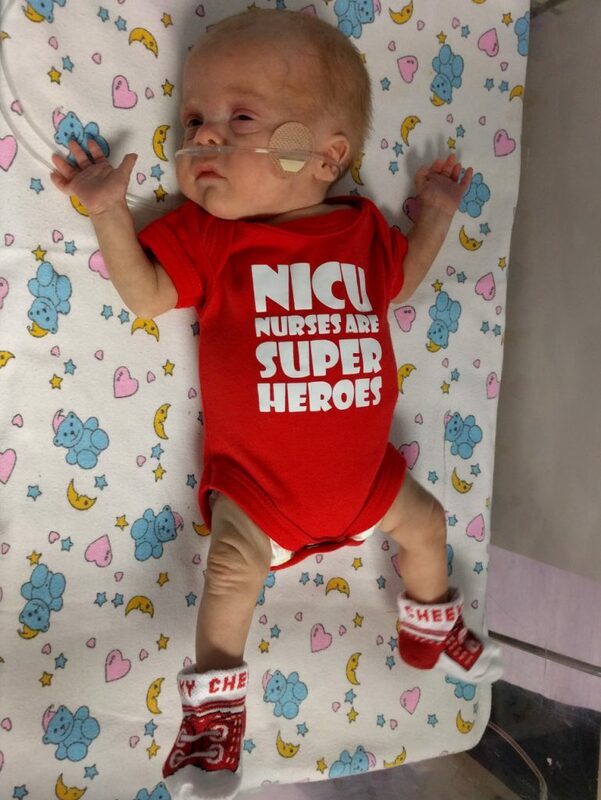 This week began with Valentine’s day and Henry exchanged cards with his fellow NICU “girlfriend”, there was a nice atmosphere in the ward and the cards made everyone laugh! Henry has really started to enjoy being handled more now, he doesn’t even object to the nurses poking and prodding his poorly hand! His incubator was changed again on Valentine’s Day so that meant more cuddles for us, we had him out for over an hour and a half this time and he was really settled. We also heard him make a noise for the first time which was a little squeak like a mouse! We should be able to have cuddles more often now he is not on a ventilator, and when he is having a settled day. I had to visit on my own for most of the week as Henry’s daddy was unwell with flu-like symptoms so had to stay away from the hospital. 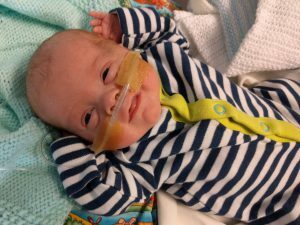 In the middle of the week Henry had a night time blip where his temperature suddenly plummeted and he went really pale, he was given a blood transfusion and recovered well, thankfully. He was checked for infection but all was clear so the cause of the blip was a bit of a mystery in the end, following this I briefly managed to dress him in his first vest but towards the end of the week he was a little unsettled and started having bradys (short for bradycardic episodes) in which his heart rate and oxygen saturation would suddenly drop, his vests were then left off so he could be monitored more easily. Sometimes he would need stimulation to help him recover from these episodes and this had me really worried but I was assured by the nurses that this is quite normal in premature babies and they grow out of it as they get older. Henry reached a whopping 1 kilogramme at the start of the week meaning he has nearly doubled his birth weight of 515 grammes! Towards the end of the week he was taken off CPAP and put onto Vapotherm which shoots high flowing oxygen into his nose through a nasal cannula, this is much nicer as not only does it mean we can see his face properly at last, it is much more comfortable for Henry and he now looks more settled with his oxygen requirements reducing as a result. As Henry is now on Vapotherm I was able to start my road to breastfeeding by trying non-nutritive sucking on an empty breast just after expressing, this is to get him used to the idea without actually feeding as he may not be able to swallow properly yet. Henry did well, he latched on straight away and seemed to enjoy it, he even had a little bit of milk on his cheek afterwards! Overall we all had a very good week. Henry is still nicely settled on Vapotherm and the flow of oxygen is being gradually reduced. Now Henry is a lot more stable we are able to get him out for cuddles once a day which is so nice. We are alternating every other day each so we both get to have nice long cuddles. 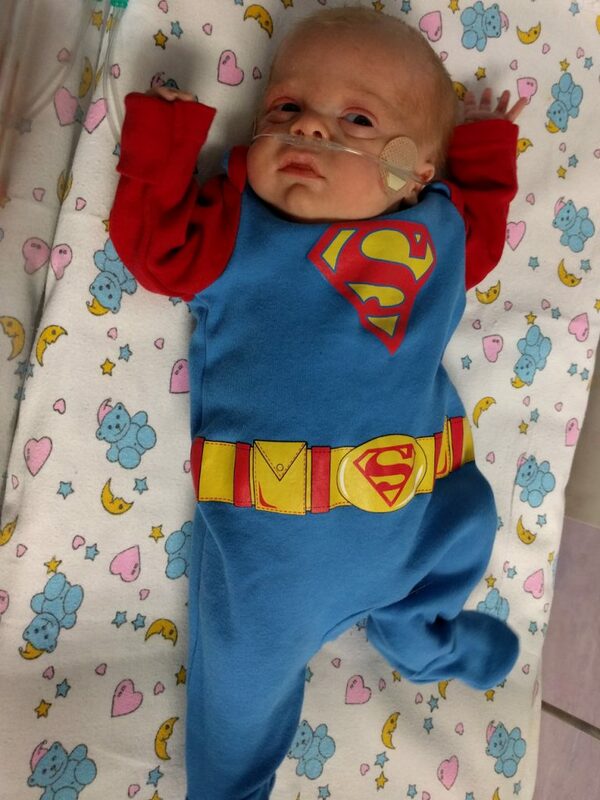 We were also able to put Henry in his first baby grow this week and he looked so cute! It is so nice to see him wearing clothes as it means a lot of his leads are hidden. Unfortunately I had to stop the non-nutritive sucking for now as Henry was doing so well with latching on, the nurses were worried about him getting a mouthful of milk and not knowing what to do with it as he is still very little and may not be able to swallow yet! Other than that we had another nice week, with lots of cuddles and Henry behaving well for all the nurses. This week began with Mothers’ Day, I was very excited and Henry got me a nice personalised mug and card. The nurses at the hospital had made a card too that had a picture of Henry on the front, this was a lovely surprise when we arrived. Another treat was that we were shown how to top and tail for the first time too so Henry got a good wash. Unfortunately he wasn’t very tolerant of cuddles though so I only had ten minutes before he had to be put back in his incubator. At least ten minutes is better than nothing! The following day we reached the huge milestone of moving out of intensive care into High Dependency, it was a little emotional at first but we are so pleased Henry has taken such a big step forward. It took both him and us a couple of days to settle into the new surroundings but we found it was very nice as the room is newly refurbished with mood lighting and relaxing recliner chairs. It is also much quieter than intensive care and we are able to spend more time with Henry as there are less doctors ward rounds and x-rays taking place. 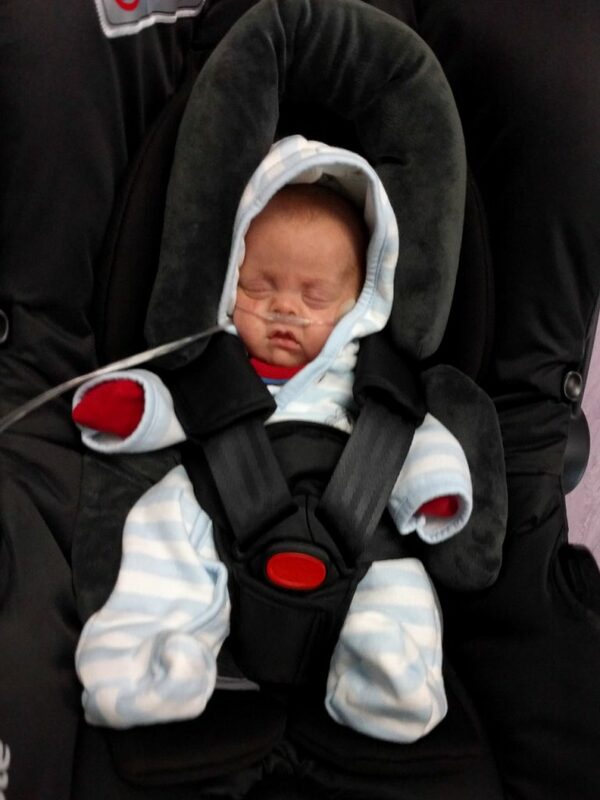 Overall Henry had a nicely settled week with his oxygen requirement and flow rate slowly coming down on his Vapotherm. Now that Henry is out of intensive care we decided to organise Archie’s funeral, we wanted to wait so we could dedicate the time to Archie that he deserves and if we had done it sooner we would have spent the day worrying about Henry. We have booked it for two weeks time on 23rd March. This week we have started to notice Henry is very uncomfortable after feeding and the nurses think it is probably reflux, this is now being monitored as it is making his oxygen saturations quite bouncy. An eye test at the beginning of the week revealed Henry has stage 1 ROP in both eyes, a condition to be expected because of his prematurity, in which the blood vessels in the eyes grow abnormally, we are just hoping it doesn’t progress to stage 3 as that would require laser eye surgery. Now Henry is a bit bigger we can get him out twice a day for cuddles so both my husband and I get a cuddle each every day. This is so nice for all of us and we are really enjoying them! I started the non-nutritive sucking on the breast again this week as Henry should now be able to swallow. Again, he did well, latching on and even getting a little bit of milk each time despite the fact that I had expressed beforehand! Henry’s reflux has continued to be quite bad this week so Gaviscon has now been prescribed and it started to make a big difference straight away. Overall this was another good week and they are still gradually decreasing the flow on his Vapotherm. We began this week with a big shopping trip to buy furniture for the nursery, a crib, pram and car seats, we know things are going to get busy once Henry is breastfeeding during the day so thought we would get organised while we have time ready for when he comes home, a day we hadn’t dared think about until now. He had another eye test this week which showed the ROP is regressing slightly in his left eye and half of the right but the other half of the right eye is starting to progress towards stage 2. Hopefully it won’t get any worse. Archie’s funeral took place on Wednesday morning and although it was very upsetting the service went as well as we could have hoped. We both managed to stand up and speak, along with my mum, and the music and poem we had chosen were just perfect, some of the nurses and consultants from the unit even came along which was very touching. In the afternoon Henry must have known we needed cheering up as he started breastfeeding for the first time and did really well. 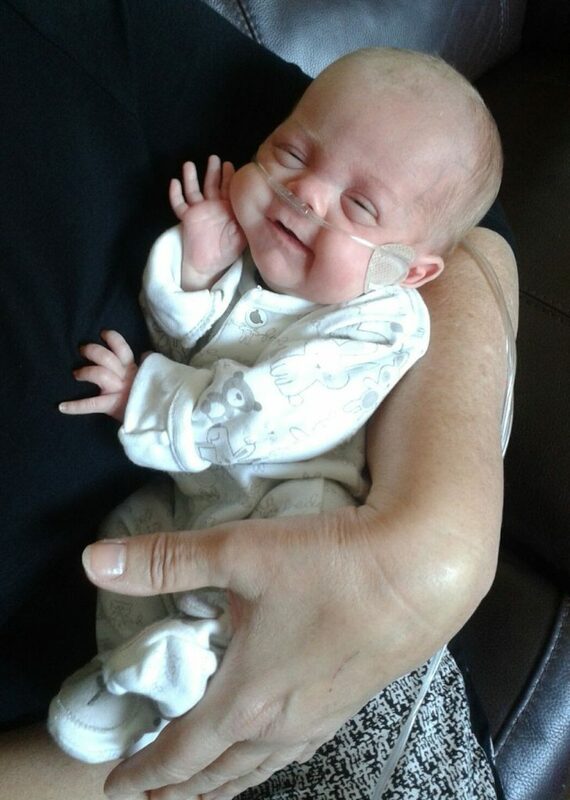 As it was his first time, he was given a full top-up through his feeding tube but it seems this may not have been needed; he must have got more milk than everyone expected as he looked a little uncomfortable for the rest of the day! 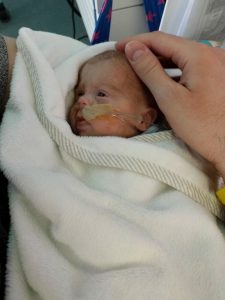 Henry’s Hb level in his blood is starting to get a little low so they are keeping an eye on this and he may need another blood transfusion, he continued with breastfeeding once a day for the rest of the week and only needed the odd small top-up. This week began with Henry’s daddy’s birthday and his present to him was coming off Vapotherm and onto nasal circuit oxygen, another milestone reached. He will be coming home on this type of oxygen too. As expected, Henry needed a blood transfusion early on this week, he looked nice and pink afterwards! This is his twelfth transfusion and hopefully the last! 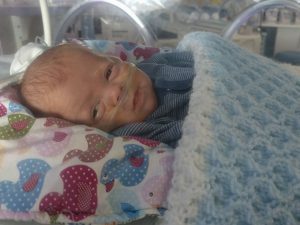 They started to wean the temperature in his incubator at the beginning of the week and by Friday he was moved into a cot with lots of blankets to keep him warm! This is good because it means we can get him out whenever we like for cuddles. We have now increased breastfeeding to twice a day and Henry has coped well, he seems to like his food, just like his daddy! This week began with Henry having his first bath, he seemed to like having his body under the water but did not like coming out as it was a bit cold. On Monday Henry celebrated his 100 day birthday and we shared doughnuts around the unit to commemorate the occasion! Early in the week we increased breastfeeding to three times a day working up to four per day by the end of the week. This meant coming in early to fit in the additional morning feed. He is now breastfed at 9am, 12pm, 3pm and 6pm and we leave the hospital around 8:30pm to go home and have dinner. By the end of the week Henry was moved down to the next level of care, Special Care, which is the final room before home! Another big milestone that made me quite emotional again! This was Henry’s final week in hospital, he had another bath and we invited grandparents to hold him for the first time, they were thrilled as they were not aware they would be allowed while he was still in hospital. As Henry is going home on oxygen we were given CPR training in readiness and the oxygen was installed at the end of the week. Henry had a few tests in preparation for home too, a general doctor’s check-up which showed everything was fine and a hearing test which also went well. We successfully roomed-in over the weekend, this was an enjoyable few days spent staying in a room together with Henry, and he put on fifty grammes overall after adding in night feeds. He even let Mummy and Daddy sleep in between too! We were touched that lots of the nurses popped by to have a cuddle and say goodbye to us and Henry at the end of their weekend shifts, it was lovely to see how much they care. They truly are a dedicated team. Day 114 – (39+1 weeks gestation) – HOME TIME! Before we could go home Henry had another eye test scheduled, thankfully this showed the ROP was regressing across both eyes. The ophthalmologist was pleasantly surprised as he said Henry is the first 23-weeker he has seen that has not required laser surgery (and he’s about to retire!). We are not completely signed off yet but it looks very promising. Finally, after all the paperwork was complete it was time to take our little miracle baby home. It was quite emotional saying goodbye to all the wonderful staff on the unit but very exciting to be going home after such a long journey. We really can’t thank the amazing team at the Oliver Fisher Unit enough for ensuring we brought home a healthy, happy little boy at the end our journey with them, however we are doing some fundraising to give a little something back. If you are inspired by our story, please consider donating. Henry enjoying home life two weeks later. If you have a similar story to share please get in touch and I will gladly share it on the Blog section of the site.